Tap a task, then tap the Details button that appears to the right of the task. In the dialog that appears, toggle the Remind Me on a Day switch to turn the feature on (green). Tap the Alarm field that appears below this setting to display date settings. Tap and flick the day, hour, and minutes fields to scroll to the date and time for the reminder. Tap Remind Me at a Location, then tap the Location field. If prompted, tap Allow to let Reminders use your current location. You have to be in range of a GPS signal for the location reminder to work properly. Use the field labeled Current Location to find your location or enter a location in the Search field. Tap Details in the upper-left corner to return to the task detail screen. Tap Done to save the settings for the reminder. 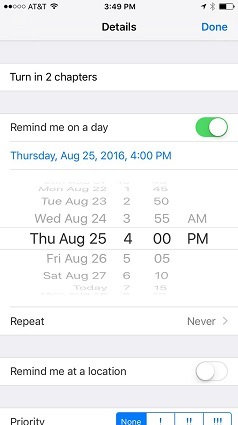 If you want a task to repeat with associated reminders, tap the Repeat field in the Details dialog, and from the dialog that appears, tap Every Day, Every Week, Every 2 Weeks, Every Month, or Every Year (for those annual meetings or great holiday get-togethers with the gang). Tap Done to save details for the task. To stop the task from repeating, tap the End Repeat field, tap End Repeat Date, and select a date from the scrolling calendar.